The Socceroos play Iraq ..in Tehran... on Thursday 11pm AEDT. 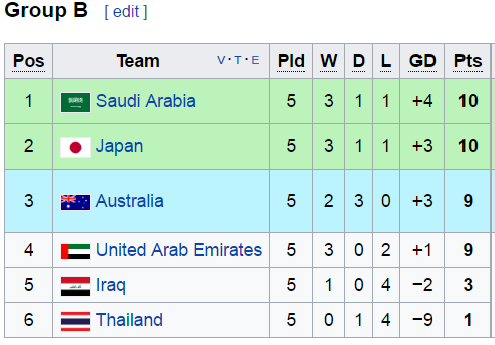 Although Iraq are sitting in 5th place in a 6-horse race, this shouldn't fool anyone - they have traditionally been tricky opponents over the years, and I highly doubt they will be walkovers this time either. This comes at a critical juncture in the Socceroos' World Cup Qualification campaign. The last result, a draw against Thailand, while not a disaster, has very much made this an uphill battle for the remaining 5 games of qualification. I personally think it will come down to us winning all 3 of our home matches against the UAE, the Saudis and Thailand. Those are must win games. I know a lot of you out there think so too. If we can do that, then the game against Japan is likely to be a 'bonus' match of sorts...but it all depends. A win is always ideal but the Socceroos, at the very least, must draw with Iraq. A draw to Iraq is by no means safe (far from it!) because, amongst other things, it would arguably make us more dependent on Japan (or whoever is the dominant team in this group..if there is such a thing here) winning all their games. 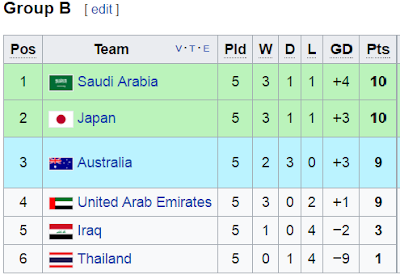 For example, if the Saudis beat [the UAE, Iraq and Thailand] they would sit on 19 points and (assuming Japan also dominate the group) Japan may have to stop them. In that case, assuming we won our home games, we would either need the draw against Japan too to pip the UAE to 20 points... or a better goal difference if we are stuck on 19. That is too close for comfort. A win against Iraq is by far the safer bet. Much has been made of the Socceroos' lack of striking options. Most Australian fans would probably agree, as we tend to rely too much on Tim Cahill. Tomi Juric looks like he needs to step up; but really, we need everyone to chip in when it comes to goals. This takes a lot more experience, something the team will have to learn on the run. Although I haven't seen him play lately, I was glad to see Nathan Burns back in the squad as I seem to remember he played quite well in the Asian Cup. It will also be interesting to see an in-form Mooy combine with a Robbie Kruse who has more match experience under his belt. Leckie has never been a finisher, but he is fast. I also wonder how Luongo and, later, Rogic (when he's back from injury) will fit into this equation. Regardless of who starts, hopefully all can supply Juric, and later, Cahill if he comes on as a late-ish sub (which seems very likely). A goal here and there from the midfield over these next 5 matches will, in all probability, be needed as well. Importantly however, we need to learn how to...not..give the ball away sloppily. And how not to concede. We seem to be lacking the rigidity we used to have. This is what makes it all so interesting, because Postecoglou will be looking at injecting fresh and..inexperienced.. blood into this team (especially with the right-back position which seems to be a question mark at the moment). But above all I do think qualification is the main priority here - there is no harm in playing younger players and/or a team with new faces at the World Cup, but we have to make it there first! This group will be very tight. We may need to go down third-place playoffs, but hopefully not. Remember: Only top two automatically qualify. If we are not careful in these next two matches we may not qualify at all.